Orhan Pamuk virtual thank to the jury. The Turkish author is to receive $16,000 for his novel “A Strangeness in My Mind,” which has won the prize for foreign literature in this year’s award. The Russian translator will also receive a cash prize. 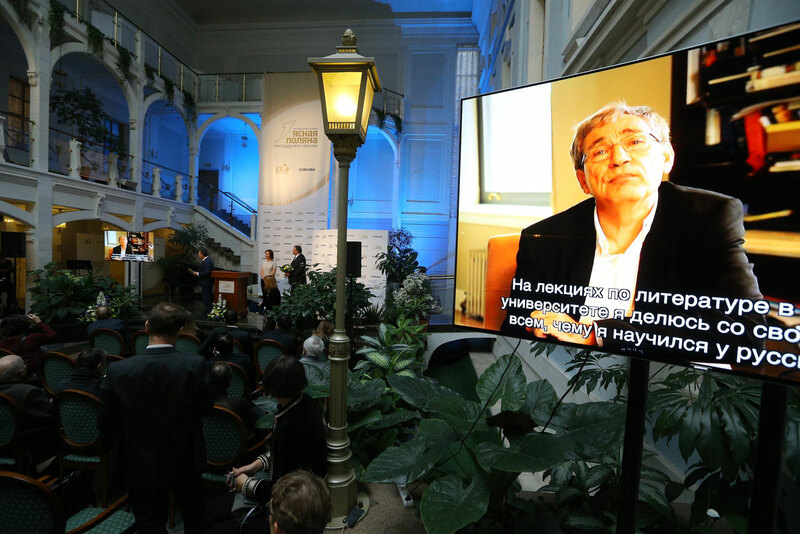 Turkish writer and Nobel laureate Orhan Pamuk has become one of the winners of the 2016 Yasnaya Polyana Literary Award, one of Russia’s leading prizes in the field of literature. Pamuk’s novel A Strangeness in My Mind, translated into Russian in 2016, won in the "Foreign literature" nomination of the award, which aims to support both the traditions of classical literature and new trends in contemporary writing. "This is a novel with many faces and stories that is unlikely to be read in one sitting, this is a declaration of love for his native city – Istanbul," said jury member and writer Alexei Varlamov at the ceremony in Moscow on Nov. 2. Pamuk was unable to attend the event, as he is currently holding lectures in world literature at New York's Columbia University, but he sent a video thanking the jury member on behalf of himself and his hero Mevlyut, a street seller of yoghurt and boza. Next February Pamuk is invited to visit the Yasnaya Polyana Museum-Estate of Leo Tolstoy in the Tula Region (160 miles south of Moscow) where he will receive his prize of 1 million rubles (about $16,000). Apollinaria Avrutina, the Russian translator of Pamuk's novel, will also receive a cash prize of 200,000 rubles ($3,000). She said that the whole novel is based on the epigraph for the second part of A Hero of Our Time by Russian writer Mikhail Lermontov: "Asians... once let them feast and drink their fill of boza at a wedding or a funeral, and out will come their knives." He also said that Pamuk consideres Leo Tolstoy his main literary teacher. The prize of two million rubles ($31,000) and the award in the "21st century" nomination will be shared between two authors, Narine Abgaryan and Alexander Grigorenko. The action in Abgaryan’s novel Three Apples Fell from the Sky takes place in a remote mountain village in Armenia. Besides being the jury’s choice, the book was also recognized by sponsor Samsung, which selected it for the "Reader's choice" award. Grigorenko’s story A Blind Man Lost his Flute tells the story of a disabled man with a strong will to live who dies despite being surrounded with the love of those close to him, simply because this is the nature of being human. The jury member Vladislav Otroshenko said the story reminded him of Leo Tolstoy's TheDeath of Ivan Ilyich. The nomination "Childhood, Boyhood, Youth" (referring to Tolstoy's autobiographical trilogy) was won by Maria Nefedova with her book TheForester and his Nymph, telling a story of a girl who starts to sing in a pedestrian underpass out of spite for her parents and begins to live life on the peripheries of society until she meets a young man who dreams of becoming a forester and is severely ill with cancer. Nefedova receives 500,000 rubles ($8,000). Vladimir Makanin wins in the nomination "Modern classics" with his story Where the Sky Meets the Hills (1984). By writing symphonies based on the songs and melodies from his native land, a successful composer eventually contributes to their death. "This is a story about the tragic element of memories and interpretations, which although they may be beautiful are never the original, which is dead," said jury member and writer Eugene Vodolazkin.